FILE - Akayed Ullah, a Bangladeshi immigrant who set off a crude pipe bomb at a New York commuter hub during morning rush hour Monday is seen in a handout photo received Dec. 11, 2017, from the New York City Taxi and Limousine Commission. A top counterterrorism official in Bangladesh said Wednesday the man accused of detonating a pipe bomb in a New York City subway tunnel does not appear to have any known links to militant groups. Monirul Islam said investigators have interviewed the Akayed Ullah's wife and her parents as part of their probe. The 27-year-old Ullah is due to make his first court appearance Wednesday, a day after U.S. federal prosecutors announced terrorism charges against him. Authorities say the Bangladeshi immigrant's attack was inspired by the Islamic State group. The charges against him include bombing a public place and using a weapon of mass destruction, each of which carries a maximum sentence of life in prison. Ullah was also accused of providing material support to Islamic State, destruction of property by means of an explosive and using a destructive device in furtherance of a crime of violence, according to a criminal complaint disclosed on Tuesday. These charges carry sentences of five to 30 years each. Joon Kim, acting U.S. Attorney for the Southern District of New York, announced the charges at a press conference in New York. "Yesterday morning, as thousands came into New York City through Port Authority, the Port Authority Bus Terminal, one man came with a hate-filled heart and an evil purpose," Kim said. "In the middle of rush hour, as everyday New Yorkers hurried to their jobs, to their schools, ready to start the work week and get going with their busy lives, one man came to kill, to maim and to destroy," he said. A member of the FBI enters the crime scene beneath the New York Port Authority Bus Terminal following an attempted detonation during the morning rush hour, in New York City, New York, Dec. 11, 2017. 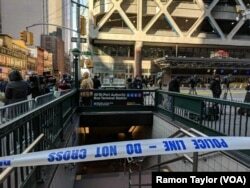 The attack took place in a tunnel that connects the Port Authority Bus Terminal and the Times Square subway stations. Surveillance footage shows the attacker walking among the rush-hour crowd, and then smoke filling the area as the device goes off. The man is then seen laying on the ground as people rush away from the scene. Kim said Ullah picked his target and timed his attack in order to "maximize human casualties." The bomb, however, did not fully explode, leaving Ullah injured and three others slightly hurt. Ullah remained hospitalized on Tuesday, and Kim said the charges would be formally presented to Ullah at his hospital bedside. In an interview with investigators at the hospital, Ullah admitted to building the bomb and carrying out the attack in the name of the Islamic State terrorist organization. "I did it for the Islamic State," Ullah told interrogators, according to the complaint. Ullah also told authorities he detonated the bomb "in part because of the United States government’s policies in, among other places, the Middle East." Ullah immigrated to the United States in 2011 and is a legal permanent resident. From 2012 to 2015, he worked as a taxi driver. 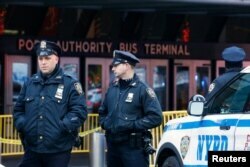 Police officers stand outside the New York Port Authority Bus Terminal in New York City, U.S. Dec. 11, 2017 after reports of an explosion. Mohammad Toha, Ullah’s uncle, told VOA’s Bangla Service that a relative had sponsored Ullah’s family to immigrate to the United States. With no known ties to a foreign terrorist organization, Ullah appears to have acted on his own. William Sweeney, the assistant FBI director for the New York field office, told reporters Ullah had not registered on the bureau’s radar for suspicious activity. The complaint details Ullah’s self-radicalization in recent years. It says Ullah became radicalized as he began watching Islamic State propaganda videos online as far back as 2014. One video exhorted Islamic State sympathizers to carry out terror attacks in their homelands if they couldn’t join the caliphate in Syria and Iraq. About a year ago, according to the complaint, Ullah began researching how to build homemade bombs. Two to three weeks ago, Ullah started collecting bomb-making materials — wires, metal screws, plastic zip ties and a Christmas tree light bulb. He built the crude device at his apartment in New York City’s Brooklyn borough a week before the attack. Police at the scene of explosion near Port Authority Bus Terminal in New York City, Dec. 11, 2017. On Monday morning, as he headed to the Port Authority station with the device strapped to his body, Ullah posted on his Facebook page, "Trump, you failed to protect your nation." The bungled attack came less than two months after Sayfullo Saipov, an immigrant from Uzbekistan, drove a truck into pedestrians in lower Manhattan, killing eight people and injuring 12 others. It was the deadliest terrorist attack in New York since the attacks of Sept. 11, 2001. Saipov was charged with eight counts of first degree murder in aid of racketeering; 12 counts of attempted murder; and one count of providing material support for terrorism. Albert Fox Cahn, legal director for the Council on American-Islamic Relations in New York, issued a statement on behalf of Ullah's family. In it, the family said they were "heartbroken by the violence that was targeted at our city today, and by the allegations being made against a member of our family." President Donald Trump said Monday's attack shows the need for Congress to pass immigration reforms "to protect the American people."